Stoke Bardolph lies next to the banks of the River Trent. It is two miles east of Gedling. 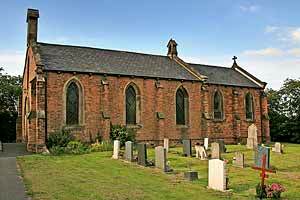 It belonged to the parish of Gedling for over 900 years. A priest and church are mentioned here in Domesday. St Luke’s is situated at the east end of the village, near the river. The current building, near or on the site of an ancient building, is a plain brick chapel with stone dressings. It dates from 1844, but subsequent alterations have included an extension to the chancel built in 1910. The church is a simple rectangular, single-celled building, measuring 33 feet by 21 feet, with a western turret containing one bell. All the interior fittings are plain. The church was not licenced for weddings until 1965.